After reading several historical fiction works, it was fun to return to modern day and read a contemporary fiction. 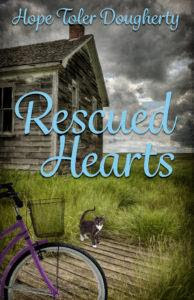 Rescued Hearts is the second book that I have read by Hope Toler Dougherty. As much as I enjoyed the first book that I read, I liked this one even more. Much like Mars...with Venus Rising (see my review here), Rescued Hearts has some quirky, lovable characters, but with the new addition of suspense. With the crafty blending of crime and romance and the utilization of characters that are like people you might have in your life, Hope created a story that was very enjoyable. The story pulled me in and had me wanting to read any free minute, so as to see what happened next. Unfortunately, as Mary Wade found her spaces invaded and questions about their safety arose, I was home alone with the kids while my husband was traveling. Not an ideal time to read such a suspenseful tale; proof positive that the story was realistic. It had me wondering how many people have inadvertently found themselves in danger as a result of a self-less act of trying to rescue an animal (or a person). Fortunately, Mary Wade discovered an inner-strength and was able to draw on her faith to find the hope necessary to help get her through. You can learn more about the book and read additional reviews on the blog tour landing page.